Lienz lies at the heart of Eastern Tyrol, which has strong historical and cultural ties with the nearby province of Carinthia. Nonetheless, Eastern Tyrolians have a very distinct local pride typical for mountain people and will not be appreciative of individuals considering them as anything but Tyrolian. The town itself is easily identified as a real stunner: Set by two of Austria′s most important mountain passes, the Felber Tauern Pass and the Großglockner Pass, the geography around Lienz alone would justify a visit. But wait, there′s more: A wild history of excessive settlement and re-settlement saves the Lienzians from any suspicion of being inbred (with few exceptions). The first people to stay in the region permanently were probably the Romans, who realised the significance of the two passes for vacations in Italy (or invasions, as they were called back then, but similarly done by Germans). Later, the region was populated by various tribes primarily of Bavarian kin in the 9th century. Throughout the Middle Ages, the strategic position and access to trade routes made Lienz a rather important place, and the counts of Görz (now Gorizia in Italy) chose the town as their main place of residence. The last one of the house of Görz died in 1500, and the county went to the growing portfolio of properties of the Habsburgs, then ruled by the legendary Emperor Maximilian I.
Maximilian incorporated the new territories to his beloved Tyrol. The last Count of Görz, Leonhard, is buried in the parish church of Lienz. This makes a great bridge to the sightseeing attractions of Lienz: Unfortunately, many of them were destroyed in the course of World War II and relatively little of the medieval core is preserved today. Start a tour on the small Hauptplatz or Main Square. The nearby Liebburg Manor is a 16th century edifice that is now used as the Town Hall. The Franciscan Church or Franziskanerkirche is proud of its Gothic frescos, but the town′s main church St Andrä with its arcaded cemetery and the tomb of Count Leonhard is a much more rewarding attraction. The interiors are packed with examples for Gothic and Baroque art, creating interesting tensions on various spots - if possible, get a guide to the interiors. Another celebrity buried here is Albin Egger-Lienz. He was born in a nearby village in 1868 and decided at some point to spice up his somewhat peasanty name up by added the "Lienz". You would be very wrong to accuse Egger-Lienz of anti-peasant feelings: After his formal training as a painter, he developed an own, very distinct style often depicting rural scenes. Farmers at work, early skiers, scenes from peasant′s lives. He remained very fond of his Tyrolian home, but since he failed to earn himself a reputation in Austria, he moved to Italy after WWI. There he was more successful und proved to become an influential figure as an early expressionist - yet not receiving any acknowledgement in Austria. After his death in 1926, the Nazis tried to hijack his work and emphasized the "heroic" or glorifying aspects of the farmers and workers of his paintings. This distorted idea still survives among certain environments in Austria, but the new Leopold Museum in the Museumsquartier in Vienna finally puts Egger-Lienz into the right light, dedicating an entire gallery to this outsider of Austrian art. The war memorial chapel outside of St Andrä Kirche contains a large fresco by Egger-Lienz, considered by many to be his most important piece of work. Finish you tour with the ancient Schloss Bruck Castle on the Schlossberg mountain. The castle has a Romanesque base dating back to the 13th century, but was re-modelled and extended in the 15th century. Today, it contains a charming Heimatmuseum with exhibits of local folk- and countryside culture, but also a collection of surprisingly fine art by local artists - most notably Franz von Deferegger and Albin Egger-Lienz. Don′t miss the castle′s chapel with its Renaissance frescos, depicting Count Leonhard and his wife. Note that Lienz makes a good starting point for hiking or skiing (depending on the season, obviously). Ask the local tourist information centre for advice on guides and where to go. 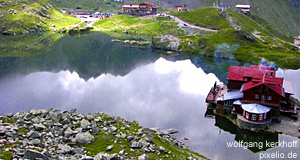 Popular destinations are the Steinermandl and the Zettersfeld, but also the scenic Alpine lakes of Neualpseen.